Future Raph, Raph and Don begin their search for Armaggon and meet some mermaid-like fairies. Back at Armaggon’s headquarters, the battle continues, but the tables are turned on our heroes when thousands of rats arrive and begin to attack. 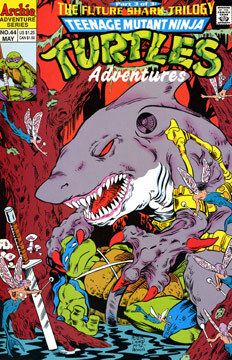 In the swamp, a mermaid fairy welcomes the Turtles to Thanatia and asks if they seek the land shark – just as Armaggon fires a missile that knocks the TMNT unconscious. Rat King arrives at the headquarters and tells the Turtles that he has not forgotten what Future Don did to his “children.” Donatello decides that it’s too risky to be seen by Rat King and sets off to rescue Future Mike, Future Leo and Merdude. Mikey takes advantage of Rat King’s ego to strike a knock-out blow and the fight begins anew. Future Don awakes just as Armaggon looms over him and the battle in the swamp erupts. Rat King awakes just as Mike, Splinter and Ninjara have defeated Shredder and Verminator X. The rodent leige uses his rat-controlling powers on Master Splinter and forces the Sensei to attack Mikey. Just as Splinter is about to finish Mike, Donatello arrives with Future Mike and Future Leo. Meanwhile, Future Raph and Raph battle Armaggon near a waterfall. Shredder, Verminator X, the Rat King and the rats now have the upper hand in their fight, but Merdude entices the cat mutant to fire his blaster, which knocks a hole into the wall and allows the sea water to come pouring into the room. Rat King and his minions flee as the other villains are washed away. Future Raph and Raph use teamwork to kick Armaggon over the edge of the falls and they find Leonardo. Master Splinter taps Future Raph on the shoulder and the Turtles turn to see an open time portal. Everyone leaps through just as it closes. Back at Turtles HQ, Future Raphael bids a tearful farewell to Ninjara and everyone returns to their own time. On the final page, we see a disgruntled Armaggon sitting forlornly in Thanatia – which is revealed to be the far future of our world.